Chapel’s dialogue here is inspired by my own grandmother, Mary Jo Capps, who is probably the most amazing 89-year-old you’ll ever meet. She lives in McMinnville, Oregon, so I don’t see her very often, but she recounts her adventures over Skype with my dad and she has a fuller social schedule than my own mom and dad combined. Mary Jo belongs to the Daughters of the American Revolution, a garden club, a local theater organization, and to top it all off, a secret society known only “P.E.O.” She was a Girl Scout leader and a Campfire Girl when she was young! Once, when I bought a locked, vintage suitcase at the thrift store without the key (for the intrigue, of course), Mary Jo came to the rescue. She asked her extensive web of contacts if any of them had that specific kind of key for a 1950’s suitcase, and lo and behold, one of them did! I received the suitcase key in an envelope in the mail a week later, with a note to save the stamp for Mary Jo’s work with Veterans. 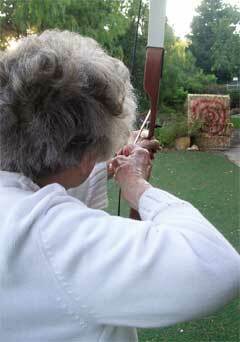 Plus, the last time she visited, she did archery for the first time since 1940 and got a bulls-eye. Check out that hot pink rotary phone that Chapel’s using in this strip. What other comics has this phone appeared in? Leave your guesses in the comments below. And feel free to tell me about your own grandparents! Answers next week! she used that phone to talk to Barnaby at the end of season 2! Wow! Other people who know where McMinnville is! My dad lives there. Small world! Oh my goodness! I bet my grandma knows them, then. She's well connected! What was in the suitcase? I think that maybe the phone was in.. um.. Barnaby, home at last? Yes, it was! And I like her bows a lot too, I think they're very cute. haha! a hedgehog socity! that is so funny! That's so cool! Hedgehog Society. Hehehe! Hedgehog Society indeed! I'm so pleased you like it! I'm SO happy you noticed and appreciated it! I worked very hard to make those poses expressive, I'm pleased it came across. Got to love our Grandmommie! I couldn't help but read that in her voice, too. I'll be darned, indeed! Ha ha, yes, that's Grandmommy for you! Oohh, I would love to learn archery someday. It's just so awesome. I tried Archery when i was younger. I got chased by an angry bull because of it. I'm going to stick to target practice with guns from here on out. are you SURE you want me to tell it? it's a bit scary and you might want to think twice about going to a farm if i tell it. My gramma's a Rosie! As in Rosie the Riveter! She worked in a factory during WWII. I still remember my grandparents, even thought all of them have passed away long ago. I still have great aunts and uncles around. I get to see them from time to time. Wow, that's lovely Taxil! Sadly, my grandma is the only one of my grandparents still alive. I met my other grandmother when I was young, but I don't remember. Is your grandma the real Rosie the Riveter, or do they just happen to share a name? Either way, that's fascinating! That's amazing! You must be stellar! Your grandmother somewhat reminds me of mine, in that they are old people way cooler than old people are supposed to be :). She really only started having memory issues in the last 3 or so years and she's 95 now. Even so, although she always thinks she doesn't remember how to play, she can still beat me an awfully statistically odd number of times in a card game we like to play called casino. For some strange reason "P.E.O." reminds me of that whole DHMO thing. Over compensating for the immaturity 3 comics ago perhaps? Is the phone the same one from "Barnaby, Home at Last"? Sorry, I can't help checking. I like computers and security and all that good stuff, besides this is harmless, right? Wow, your grandma sounds amazing! I bet she could decimate even Fred when it comes to card games...And yup, you were totally correct about the phone! Good guessing! I know, isn't it fabulous? sounds like awesomeness runs in the Capps blood line indeed! This is no secret, but I too am apart of a Semi-secret group called "The Odd Fellows". The P.E.O. isn't a secret society, but a privet one, like mine is. I am amazed that she got that key, if i was me, i would have picked that lock instead. Oh, I know about the Odd Fellows, there's an office at the beach I frequent. That's neat that you're a member! Yes, we are an old time group. it is a shame that not just us, but almost every fraternal order is dwindling in numbers. the blame can fall on many reasons, but naming them won't change anything. We (both the Odd Fellows and the rest of us) need the youth (that would be you wonderful Chapel's faithful and family) to learn about us and JOIN us. We help those in need and we do it unified. A lone person can help another, but when we all join together, we can produce a bigger and better result. We can open your world and mind much more than sitting at your desk reading the 'net can do. The Odd Fellows are also NOT a man's only group. we accept women as well. I can and will answer any questions you have about the Odd Fellows now. On a suit case? yeah, usually isn't very difficult although if it's an older one it might actually have a semi-decent lock on it, I suppose. Your ability to add humor and originality to your work never ceases to amaze me. Wow, what a wonderful compliment! Thank you so much, that means the world to me. Thank you, you're kind as always!